Each of the carving options below can be customized with any design of your choice. We have a large selection of headstone designs as well that you can browse at our store. Woodlawn Memorials specializes in personalizing each monument or headstone to exact specifications. Shape Carving: The outline of the design is sandblasted and the interior is shaped to create a 3-D look to the design. Shape carved designs are commonly used on roses, flowers and leaves. They can also be used on many other designs such as praying hands. Sandblast or Flat Carving: This particular type of work consists of placing a design on a rubberized mask, cutting out the lines and outlines of the design and then sandblasting the exposed surface. Sandblast designs are the most basic type of carving available. 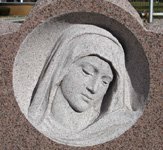 Sculpture / Statues: Sculptures and granite statue carvings consist of an image that is hand sculpted using many different pneumatic chisels and other granite carving tools. The quality of a hand sculpted statue will vary greatly depending upon the individual sculptor. Etching: A hand etching consists of using a diamond tipped engraving tool to draw or “etch” directly onto a polished monument. 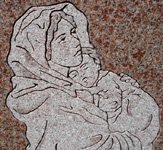 An etching looks best when it is done on a polished black granite monument because this will give you the greatest contrast. 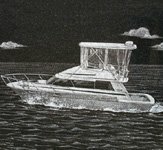 Etchings can also be done using laser machines. These are called laser etchings. Etchings can even be done in color. 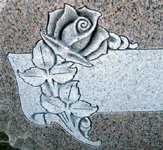 Fonts and Lettering Styles: There are many lettering types that can be used to inscribe a headstone or granite memorial.